The bodies of Officer Stanley and Officer Andy Begay were discovered inside a burned-out tribal police vehicle in Copper Canyon, an isolated area near Lake Powell. The two officers were handcuffed and shot, but had in fact died in the fire. Subsequent investigation revealed that during the night Officer Stanley, 27, had been overpowered by the participants of an alcohol party near Goulding, Utah. He was then forced to call Officer Begay, 35, to the scene. Upon arrival of the second officer, both victims were shot and placed in the rear of a patrol unit. Their vehicles were driven into Copper Canyon with the intention of dumping them into Lake Powell. However, when the vehicles became stuck in the sand, they were set ablaze. Although cultural differences hampered the investigation, four suspects were arrested three months later and charged with the murders. The case against one suspect was eventually dropped. One suspect was acquitted. The remaining two were convicted of first-degree murder. Both are serving life sentences in federal prison. Officer Stanley was married and the father of a son. His wife was expecting their second child at the time of his death. He is buried in Monument Valley Cemetery. 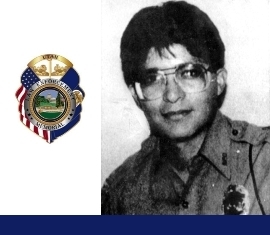 His bronze name plaque is sponsored by the Utah State Parks Officers Association. We at the Utah Fallen are looking for contact information for Officer Stanley’s family and relatives. If anyone can help us with this (it is kept confidential and only used to contact family when events related to Utah’s Fallen Officer events occur)it would be greatly appreciated. My contact information is BL Smith Sandy City Police 10000 South Centennial Parkway, Sandy Utah 84070 801 568-7240. I was a Criminal Investigators assigned to this case, I would suggest you contact Jesse Delmare at the Ft. McDowell Police Depatment in trying to reach the family. His sister and brother in law are Marie and Gary Holiday. Contact oljato chapter house.